Q. How much is tuition for my child(ren)? A. Click here for more information on tuition or refer to our school office (440-777-8433). Q. What forms of tuition assistance are available? A. Financial aid can be applied for each year from January 31 – March 15. FACTS Management administers the financial aid application for the Diocese of Cleveland and St. Brendan School. A completed 1040 tax return and supporting documents are necessary to complete the application. The Diocese of Cleveland notifies families in April if financial aid is awarded. If additional aid is available at the parish level, St. Brendan School notifies families of assistance in May. Financial aid is finalized for the year, before the first tuition payment is charged, on June 15. Families who would like to apply for financial aid need to go to FACTS and complete the online application. Completion of the FACTS application is required for all tuition assistance. Contact the Church Office at (440) 777-7222 or School Office (440) 777-8433 to find out more about tuition assistance. Q. How much are school fees? A. The non-refundable registration fee for Preschool through Grade 8 is $50.00 per student. The fee must be submitted with the registration form to begin processing. Q. How can I enroll my child(ren) at Saint Brendan School? 2. Submit the registration fee; $50.00, per child. 3. A copy of your child's Birth Certificate & Baptismal Certificate (if not baptized at St. Brendan Church). After the aforementioned are submitted and the registration form is reviewed, you will be contacted by the school office for confirmation that all necessary information was received. 4. If your child is transferring from another school a release of records form must be completed and submitted to St. Brendan School. A copy of your child's most current report card needs to be submitted. Once St. Brendan School receives the information, you will be contacted to complete the registration process and set up a meeting with the school principal. A. The school uniform is required to be worn from the first day of school in August to the last day in May/June. This applies to all students in Kindergarten through Grade 8. A uniform is also required for physical education. The uniform guidelines can be found in the Parent Student Handbook which can be found on the school website. In addition, a hard copy will be sent home upon request, at the beginning of the school year. Preschool students do not have a required uniform. Q. Where can I purchase the school uniform? A. School uniforms may be purchased through Schoolbelles located at 4747 West 160th Street, Cleveland, Ohio, 44111, (216) 898-5500 or online at www.schoolbelles.com use school code S0136. It is recommended that uniforms be ordered early in the summer so that they are available to the student at the start of the school year. Q. Where can I purchase the physical education uniform? Q. Where can I purchase St. Brendan spirit wear? A. Spirit wear may be purchased directly from Hometown Threads. Customized and standard spirit wear is available throughout the year. Q. What is the daily schedule for Kindergarten through Grade 8? Q. What is the Preschool schedule? PK4: Monday – Wednesday (8:30 A.M. – 11:00 A.M). Preschool students are dropped off and picked up at the designated side door of the school, in front of the John R. Kenney Center awning. The preschool teacher and aide greet them and dismiss them with parent assistance. Q. What is the morning procedure? A. Students may enter the building at 7:30 A.M. Cars form a line in the parking lot along the side of the school to drop students off. Upon their arrival, students report to the John R. Kenny Center (gymnasium) and are supervised until the 7:50 A.M. bell. There is no outdoor supervision in the mornings. Q. What is the routine in the parking lot for student pick-up? A. The car line begins in front of the church and continues around the perimeter of the parking lot. Each family is provided a family name sign for their car. The sign must be visible for students to be released. At 2:30 P.M., the cars pull up curbside of the school and students are dismissed to their family marked cars with faculty/staff supervision. Q. Do you offer Before and After School Care? A. We offer After School Care (ASC) from 2:30 P.M. to 6:00 P.M. Monday through Friday on days that the school is in session. Specific details are available within the ASC Handbook. Q. Is a Hot Lunch Program available? A. The lunch program is available through North Olmsted Central Kitchen. Meals are prepared and cooked at Central Kitchen, transported to SBS, and then served by the kitchen manager. Menus are sent home at the end of each month, posted on our School Management System, Option C, and the school website. Applications for free/reduced lunch are available on the website or through the school office and must be resubmitted annually to be considered for assistance. Q. What curriculum does the school follow? A. The Diocesan curriculum is in alignment with the State of Ohio standards. In addition to the state standards, our Catholic tenets, identity and religious instruction are infused throughout the Course of Study. Q. How is our Catholic faith instilled and permeated throughout the school day? A. The overall curriculum is Anchored in Faith. The students have daily formal Religious instruction in grades K - 8. However, Catholicism is a way of life. Students attend mass twice a month, pray the Stations of the Cross during Lent, focus on the Blessed Mother and the Rosary during the months of October and May, celebrate the Saints on a regular basis, participate in a yearly class retreat and are involved in many Christian community service/learning projects and more. Q. How do the students interact with today's technology? A. Our Saint Ita Technology Suite hosts state of the art technology. The Suite houses 12 MacBook Pros, 18 iMac computers and an LED television customized to use the technology effectively within the education process. Students in grades 1-8 are assigned their own iPad mini that they use diversely throughout the school day. 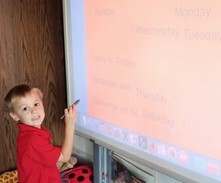 Each classroom is equipped with an ActiveBoard or an Epson Interactive Projector and an Apple TV. Students are challenged to become engaged and active in their learning process. This practice leads them to become self-directed learners and collaborative problem solvers. Q. What is the school's homework philosophy? A. At Saint Brendan School, we look forward to being a true partner in the faith based education of your child. As such, we are depending on you for support in that your child's homework assignments are being completed to the best of their ability. Homework is given with purpose and meaning on a regular basis in grades K - 8. Homework is an effective means to reinforce skills (especially reading and math computation) and to allow for extended learning opportunities. Q. What professional services are provided for the students? A. A tutor provides individual and/or small group instruction for students who qualify for Title I reading, the learning disabilities program, and/or remedial instruction through North Olmsted City Schools. Our staff also includes a school nurse, school psychologist, and a speech and hearing therapist on a part-time basis. Q. How can parents / guardians stay posted on what is going on at St. Brendan School? A. St. Brendan has a website with an abundance of school information. E-mails are sent home regularly via our School Management System, Option C, to keep parents / guardians informed. Follow us on Twitter @SBSNavigators. We also have a Facebook page that is regularly updated with student activities and pictures. Q. Who do I contact to address questions about my child's academic and spiritual needs, or other matters? A. Parents/guardians are asked to contact the teacher directly. They have direct knowledge of what transpires in their classroom. The principal is available for additional guidance/direction when needed. Q. How are progress reports and grades communicated to the parents? A. We utilize an Internet based program, Option C, to communicate grades and track homework assignments. Each parent and student is given a user identification code and can access grades via the Internet. Teachers update the grades, at least, every two weeks so that you have a regular report. Parents may also email teachers through this system. Q. Are you going green? A. Option C and email will be used as much as possible to disseminate newsletters, communicable reminders, updates, messages and to give school closing information. Q. How will I know when I am scheduled to work Bingo? A. Bingo is held on Friday evenings to help subsidize school expenses. Parents are scheduled to work about 4 Bingo assignments a year. A letter with the Bingo schedule is sent home from the Parish Office, as well as it being posted in the weekly church bulletin. A. There are many opportunities to volunteer at the school, which are communicated through the weekly newsletter (i.e. school events, classroom assistance, after school clubs, recess, and more). Volunteers are required to take the Virtus training program (Protecting God's Children) as well as have a background check prior to volunteering. The Parent Student handbook has detailed information. Q. What is the Holy Family Program? A. The Holy Family Program is the sacramental preparation program for St. Brendan Parish. Families with children who will celebrate First Eucharist and First Reconciliation (traditionally 2nd graders) participate in this year-long family preparation program. The parish supports parents in their role as primary educators of the faith (the role parents agree to at their child's Baptism) with parent meetings, family retreats, and other materials. Preparation for the two Sacraments takes place at home and involves the whole family. Religion classes support and reinforce what is being taught at home. Q. How do I get involved with the PTU (Parent Teacher Union)? A. Information regarding PTU membership is distributed in August. To learn more about how our PTU is active in the school and how to get involved, go to our website under Parent Resources or email at ptu@stbrendannortholmsted.org with questions.